Cloud Productions of Auckland are one of the few companies in New Zealand licensed to compile Music Videos for public displays. They are dominant in the hospitality market supplying Digital Jukeboxes to bars, clubs, restaurants and bowling alleys throughout New Zealand and Australia. Their Jukeboxes are continually updated using a network based on Telecom cell phone technology. Since 2005, Cloud have utilised Wallflower Dynamic Digital Signage Software to provide an optional advertising and promotional capability for their installations. As an extension of this Cloud now have a number of Supermarkets and Liquor outlets utilizing this technology for advertising. Cloud realized that in many retail installations shoppers did not look at the display screens and so they adopted an innovative approach to solving the problem. In Supermarkets displays always show the current special promotions and are zoned to show content relevant to the aisles where they are located. 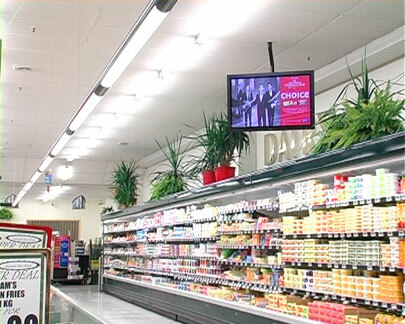 This naturally makes the displays a ‘destination’ that shoppers return to knowing they will find relevant information. To further attract shoppers to view the displays they decided to include music video content along with promotional media. The deployment of these with Wallflower Dynamic Digital Signage Software was straightforward using the Wallflower ability to include capture card sourced media. One of the Wallflower Dynamic Digital Signage display players is installed with a Cloud Digital Jukebox. That player shows a combination of music videos and promotional media in constantly changing formats. A capture card installed in the jukebox sends a signal out to all other players in the store. The other players receive the signal containing the Music Video content. Using this approach the store can be zoned to play media relevant to each screens’ location. At the same time all screens are able to play the same Music Video content synchronized storewide. At any time each display will show different media in a format suitable to its location but all video and sound is synchronized. The Cloud network is used to update Music Videos and promotional media. The Cloud Jukebox is able to deliver Music Videos themed by time of day and other criteria to maximize the shopper experience. Visit www.cloud.co.nz for more details of Cloud Productions.